Forget the candles and flowers! 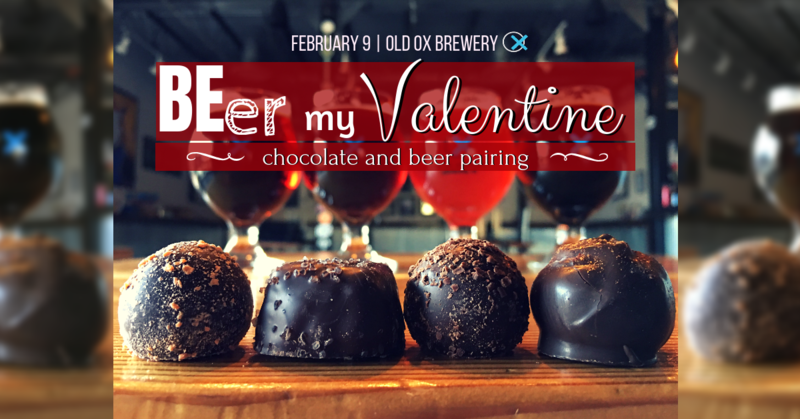 Whether you’re showing how much you appreciate and care for a spouse, a significant other, a grandparent, or even a dear friend, nothing says I Love You quite like handmade, local craft beer and handmade, local chocolate! We’ve partnered with local chocolate themed restaurant, The Conche, for a special beer and chocolate pairing event. After rigorous taste testing we found the perfect pairings and brewed 4 beers specifically for this event! KRISTIN’S PASSION – our Mexican Hot Chocolate Imperial Porter brewed with cocoa nibs, cinnamon, vanilla bean, and red chillies. One of our most sought after limited releases of the year! It brought home the bronze in the Spiced Beer category in the 2018 VA Craft Beer Cup. KVEIK IPA- “Kveik” is a dialect word for “yeast” in Norway. It refers to a family of landrace strains of yeast that tend to be used in farmhouse-style brewing. This IPA was brewed with a mix of three of kveik strains and gains mango, orange, stone fruit, and honey notes from the yeast that pair well with pineapple, citrus, and pine aromas from the Denali and Citra hops. We will also have live music throughout by Felix Pickles and Jambalaya Bros if you get more hungry! Tickets are VERY limited! This event WILL sell out so act fast! Buy your tickets here.